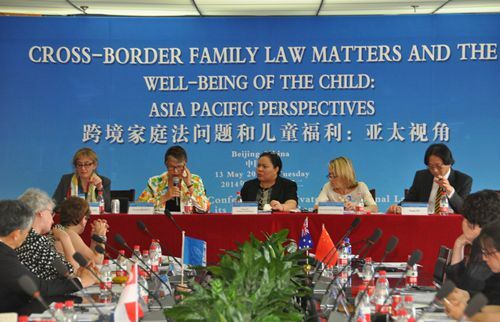 On 13 May 2014, the Conference "Cross-Border Family Matters and the Well-Being of the Child: Asia Pacific Perspectives" took place in Beijing, People's Republic of China. The Conference focused on the Convention of 25 October 1980 on the Civil Aspects of International Child Abduction (1980 Child Abduction Convention). The event was organised by the Hague Conference through its Asia Pacific Regional Office and Renmin University of China, with the support of the Government of China. Financial support was provided by the International Academy of Matrimonial Lawyers (IAML) and two renowned Chinese law firms: the Withers and Lipman Karas. More than 110 judges, governmental officials, academics and other experts from six Asia Pacific States (Australia, China (including Hong Kong and Macao), Japan, the Republic of Korea, Philippines and Singapore), as well as two specially invited experts from both the United States of America and the United Kingdom attended the conference. The conference attracted a significant number of academics and practitioners from Mainland China and Hong Kong as well as diplomats from many of the foreign embassies situated in Beijing. The conference began with keynote speeches by Professor Louise Ellen Teitz (First Secretary of the Permanent Bureau of the Hague Conference), Lady Justice Jill Black of the English Court of Appeal, and Ambassador Susan Jacobs from the U.S. State Department. The Chinese speakers shared their views on the differences between the requirements and obligations imposed by the 1980 Child Abduction Convention compared to China's domestic practices. Other speakers talked about the implementation of the 1980 Child Abduction Convention in their countries. The conference raised the participants' awareness of the 1980 Child Abduction Convention and provided a regional forum for the exchange of information, experiences and practices of Asia Pacific States in cross-border child abduction cases and related issues. The participants recommended that the dialogue should be continued, with increased efforts to study and exchange viewpoints on this Convention and on how to enhance child protection measures in the Asia Pacific Region. The conference also highlighted the important role of the Regional Office in supporting the goals and activities of the Hague Conference in the Asia Pacific region.